1919. 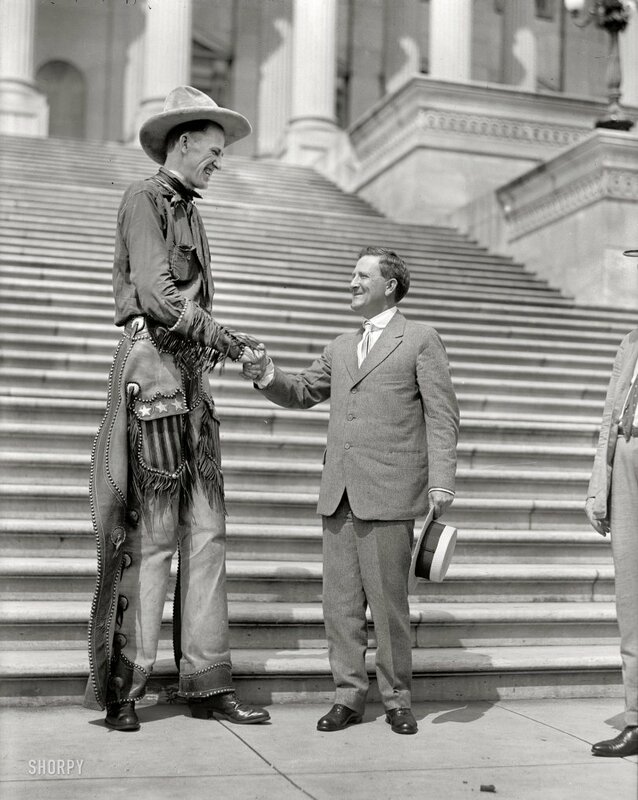 "Ralph E. Madsen, the tall cowboy, shaking hands with Senator Morris Sheppard at Capitol." Harris & Ewing Collection glass negative. View full size. Submitted by Anonymous Tipster on Sat, 05/09/2009 - 4:41am. His horse must've been a helluva animal. Submitted by Anonymous Tipster on Fri, 05/08/2009 - 12:52pm. Submitted by Dave on Fri, 05/08/2009 - 9:50am. Submitted by Anonymous Tipster on Mon, 05/04/2009 - 9:11am. It appears that even back in 1919 politicians were looking for any opportunity for a photo op. Submitted by Anonymous Tipster on Mon, 05/04/2009 - 12:27am. the Texas expression: A long drink of water. Submitted by Older than Yoda on Sun, 05/03/2009 - 1:03pm. This photo made me think of an oldtime (and possibly politically incorrect) comic of my youth titled "Mutt and Jeff," about two close friends, one of whom was exceedingly tall and the other exceedingly small and their zany antics. And then came to mind the nursery rhyme about "Fat and Skinny" who had a race, all around my pillow case, Fat fell down and broke his face and Skinny won the race." Harmless nonsense in the old days, forbidden and offensive today? Submitted by John McLaren on Sun, 05/03/2009 - 12:55pm. Ralph Madsen, born in Norfolk, Nebraska, died in 1948 at the young age of 51. He was billed in circus side shows as the world's tallest man and had a couple of nicknames: Sky High Madsen and High Bill Madsen. Submitted by stanton_square on Sun, 05/03/2009 - 12:25pm. R.E. Madsen, of Ranger Texas, came to Washington yesterday to see the Marines parade. He tried to join the Leathernecks once and the recruiting officer looked at his 7 feet 7 inches of perpendicularity and said he was too good a target. So he thought he would anyway get first hand information on how ferocious a brigade or two of Marines look, by coming to Washington. In front of the White House a woman fainted during the parade. Madsen picked her up and took her out of the crowd. When she regained consciousness she looked at the tall cowpuncher and fainted again. Madsen is perhaps the tallest man in the world and is still growing. He is only 22 years old and was a cowpuncher in Ranger country. Since the discover of oil there has not been much punching to do, so Madsen decided to come east with his friend, Sam Houston, of Amarillo, Texas, and see the sights. Submitted by Anonymous Tipster on Sun, 05/03/2009 - 12:13pm. Morris Sheppard, the senior senator from Texas, was in office from 1913 until his death in 1941. An ardent Prohibitionist, he was one of the authors of the Volstead Act, and remembered for his conviction that "there is as much chance of repealing the eighteenth amendment as there is for a hummingbird to fly to the planet Mars with the Washington Monument tied to its tail."